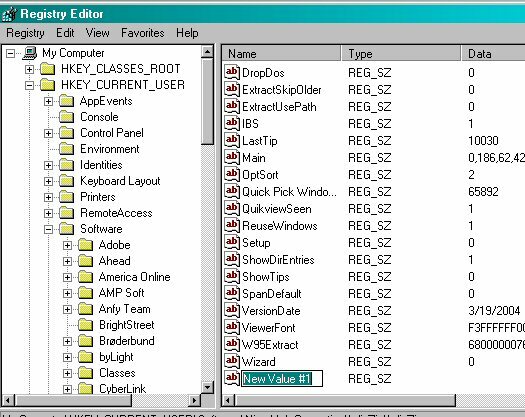 Editing the Registry in order to unzip a zipped file with empty folders in it. Note: Be very careful when you edit the Registry. You can cause lots of harm if you delete something or make a bad entry. If you follow these instructions step by step and don't mess with any other files, you will do just FINE!! THIS IS HOW TO DO IT IN WINDOWS 2000. SORRY I DON'T HAVE XP. Click on the plus sign beside the folder HKEY_CURRENT_USER. Click on the plus sign beside Software. Then go down to Nico Mak Computing. Click on the plus sign beside Nico Mak Computing. Where it says New Value #1, type in ShowDirEntries and press enter. Then close the registry window. Now go unzip that file!